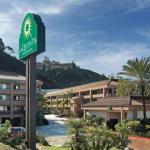 With a free breakfast and free Wi-Fi La Quinta Inn San Diego Seaworld/Zoo Area is not only comfortable it's a great value for the money. The three-story 169-room hotel makes your stay easy with a microwave fridge and coffeemaker in every room. You can grab that first cup of joe before hitting the free breakfast with waffles pastries and yogurt. Breathe easy at this non-smoking hotel and feel free to bring your four-legged best friend. The fitness center is there if you want itâ? ?and you can throw those workout clothes right into the guest-use laundry while you cool down with a dip in the pool or soothe your muscles in the hot tub. A business center is on hand for the odd work-related task and there's free Wi-Fi in all of the rooms. Parking is available for an additional fee. The hotel is in the Mission Valley area north of the center of San Diego less than four miles from the San Diego Chargers' Qualcomm Stadium. Five miles away is SeaWorld and you can check out other animals at the San Diego Zoo four miles away. The Old Town trolley is within walking distance of the hotel and will take you to the charming mission village where San Diego got its start. Dining options are within a short walk of the hotel and the famed Gaslamp Quarter renowned for its restaurants and nightlife is five and a half miles away. Dogs of all sizes are allowed for no additional pet fee; there is a pet policy to sign at check-in. Dogs may not be left alone in the room.